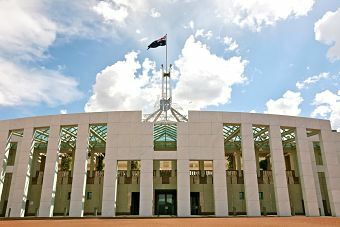 Parliament House Canberra. Alex Proimos. flickr cc. Economies such as ours are now experiencing a new debate about localism (as it is described in the UK), or a increasingly broad role for city government or regions (this being the focus of the debate in the United States). The Europeans have for some time called this subsidiarity for some time. Community deals is another way of thinking about it. This trend to localism has also begun to emerge in Australian public policy debates, which turn on a positive view of the public sector and its many institutions. We have seen this over the last 12 months in the reviews by Sandra McPhee into jobactive, by Peter Shergold in his review — still not released — of settlement outcomes for refugees, and just last week by David Thodey in his ongoing review of the Australian Public Service (APS). It is all about connecting flexibly at the local level with networks, service providers, local government, and opportunities. By this means, we can localise accountability and build connection and support for those who need it. The Centre for Policy Development has been active on this front for some time. We have found that locally-connected, place-based approaches to delivering critical services achieve good results. In recent months, one of our staff members has been embedded in the City of Wyndham to help them develop a new economic and social inclusion framework. The City hopes to receive State and Federal funding for the trial. This requires activity-based funding for recognised pathways to employment, not a tender-based model driven by price rather than results. It means Canberra letting go to a backbone institution at the local level. It requires an active role for government on the ground. The current system is madness. We have buckets of money being spent by federal, state, and local governments, as well as by charities, on the same people, without any coordination, often without local experience, and usually with poor results. Coombs found in the mid seventies that the Commonwealth needed to find a new way to operate at the local level. It has been a singular failure in social policy programs. We need to admit failure, and invent new approaches. I hope local approaches are backed and our obsession with the contracted state ends, because of David Thodey’s review of the Australian Public Service (APS). But I fear we are at grave risk of dancing around the most critical reforms. The announcement last week by Minister O’Dwyer that jobactive contracts would be extended by two years to 2022 is the latest example of putting the hard reforms into the too hard basket. Which brings me back to my brief, and to the Australian Public Service. In a speech about 18 months ago, I argued that government and the public service must get back in the game. We need that now more than ever. The starting point for Australian missions — the starting point for our new moonshots — is to reinvest in the creative elements of our public services, enriched by direct experience of the services Australians expect government to provide. We must return to a public service able to provide frank advice to Ministers, while securing continuity in our system of Government. This must involve respect for the culture and values of the public service, a significant investment in its capability, and acknowledgement that the untested and supposed superiority of the private sector is actually an illusion cultivated by rent-seekers monetising service delivery opportunities, constraining advice in the public interest, or pretending that what matters is efficiency and nothing else. Security for the most senior public servants must be reintroduced, such that they may safely offer tough independent professional advice in the face of stakeholder blandishments, whims, and aggravation at the Ministerial level. A strong Public Service Commission (PSC) should be legislated, to bring together many of the functions scattered to Prime Minister & Cabinet, Finance, and Secretaries when the Public Service Board was abolished. The NZ model is the best of those available, better indeed than the current PSC in Canberra and the strong NSW approach introduced at the beginning of the Premiership of Barry O’Farrell. Formalising the role of Ministerial Advisers to make them accountable for their actions, able to be summoned before Parliamentary Committees and investigated by integrity agencies. The current system of advisers dates from the Whitlam period, but has morphed into something quite different and dangerous. It needs greatly increaseformality and accountability to avoid a descent into assaults on the national interest. An Integrity Commission with a broad brief to investigate maladministration, deficiency in policy advice, and incompetence in program management. This is likely to be most effective when FOI legislation is substantially reformed to reduce the range of exemptions from release, and actually require the public release of business cases and business plans prepared to support capital investments and program initiatives actually approved for implementation. Current FOI systems encourage obfuscation, and support Sir Humphrey’s dictum that Freedom of Information should actually operate as Freedom from Information. Other comparable democracies have disclosure regimes which look like the speed of light compared to our glacial progress. It breeds distrust, and needs to stop. Thorough overhaul of laws governing political donations, and the early release of information about donations. Again, NSW has taken important steps in the right direction, but we should go further. The expense of political campaigning is considerable, and requires increased public subsidies, not donations from rent-seekers pursuing preferment. Unless we renovate our institutions and the approach taken by the federal government to the delivery of services, we are at risk of heightened populism in the next decade, and all the disharmony and simple nastiness which will flow from it. All of us have responsibility to advocate for a debate about the next wave of big ideas — the missions we can all support and — a contemporary view of the light on the hill. Terry Moran AC FIPAA, Chair, Centre for Policy Development, was formerly Secretary of Premier’s Department in Victoria, and Secretary, Prime Minister and Cabinet in Canberra. Extracts from an oration at Melbourne University on 25 March 2019 in honour of Jim Carlton AO. Republished from John Menadue’s blog Pearls and Irritations.